Many thanks for all the comments and info on the film - lovely photos from Vaughan and Fred too! The second film from the same family has now been edited and uploaded to YouTube - theis is from 1972 and they appear to be on one of the Aston Mars class of cruisers, but I couldn't quite make out the registration number to be certain which of the class it was. Another interesting film, this time concentrating on the southern Broads. Excellent panoramic view of the Whitlingham Sewage Works outfall. I remember it well! "Regal Lady" is now normally a resident of Scarborough after a substantial rebuild. Regal Lady began life as the passenger steamer "Oulton Belle" built by Fellows & Co of Great Yarmouth c1930 for the Yarmouth and Gorleston Steam Packet Company. She was requisitioned by the Ministry of Defence during WW2 for work as a fleet tender on the Clyde. She is apparently listed as being one of the Dunkirk "Little Ships", but one of her former skippers, Jack Cates, was apparently adamant that she never went to Dunkirk. 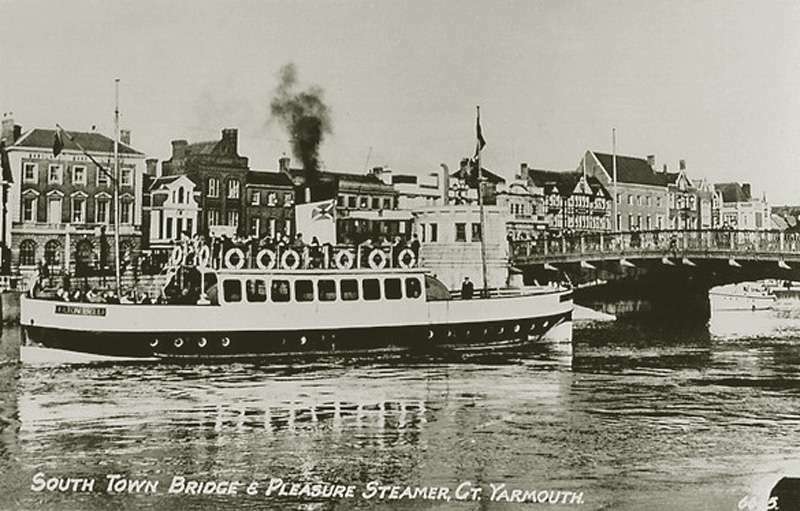 She returned to Gt Yarmouth after the war and continued to be used for pleasure trips. In 1954 she was sold and moved to Scarborough where she was renamed Regal Lady and was converted to diesel. She returned to the Broads in 1970 when she was bought by Neville Blake who, along with son Kim who supplied this info, operated her from Norwich until 1984. She was moved back up the coast to Scarborough in 1986 and, I believe, is still running passenger trips up there today. The photo below shows her in her earlier incarnation as the Oulton Belle at Great Yarmouth. Another feature of the Regal Lady was that she was a double ender, with a rudder at both ends. I didn't know Jack Cates used to skipper her? He was one of the Albion's most famous skippers and I had the honour of meeting him, and his brother Walter, a couple of times.